The percentage of an employee’s pre-retirement monthly income that he or she receives each month after retiring. The rate is a common measure that is used to determine how effective a pension system is. The fertility rate a nation requires in order to maintain its current population. It may also include net migration – the number of people who die and emigrate each year balanced against the number of babies that are born plus how many people immigrate (come to live in the country from abroad). The noun ‘replacement’ can be traced back to 1790 with the meaning ‘act or fact of being replaced’; also in England. It is a combination of the verb ‘replace’ and the suffix ‘-ment’ meaning ‘something that replaces another’. In the advanced economies (rich nations), the replacement rate is usually set at 2.1 children per woman. The additional 0.1 reflects the probability that a percentage of offspring will die before their parents. In the developing and emerging nations, where infant mortality is higher, the replacement rate ranges from slightly to considerably higher than in the rich countries. Since about twenty-five years ago, the fertility rate in some nations has slipped well below the replacement rate. Experts say that this has occurred for a number of possible reasons, and that if this trend continues, those countries in future will face serious problems funding their state pensions and caring of their elderly citizens. The replacement rate and total fertility rate of a nation are not the same. For example, the total fertility rate of the United Kingdom in 2016 was 1.89 children born per woman, but its population increased. This was because the number of immigrants – people coming into the country from abroad to live in the UK – was considerably higher than the number of emigrants – British people who went to live abroad. Some Southern European, Eastern European and East Asian countries had total fertility rates of 1.3 – these are known as the lowest-low fertility nations. At the beginning of this century, over half of the population of Europe lived in nations with lowest-low fertility rates. Since then, some have improved and are nearer their required replacement rate. The replacement rate, also called the net replacement rate, refers to what proportion of a person’s salary – when they were working – their pension today represents. If your monthly salary was $2000, and your pension is $1,200 per month, the replacement rate of your pension is 60% – sixty percent of $2,000 is $1,200. It measures how effectively people’s pension systems provide an income during retirement to replace earnings while they were in employment. Source: data.oecd.org – this is a data file that downloads. Income replacement requirements vary from person to person. The amount we may need depends on the standard of living we wish to maintain plus an understand of how much it will cost us to maintain that standard. For example, if John Smith and Mary Jones both earn $120,000 per year, but John requires $60,000 annually to maintain his desired standard of living while Mary requires $80,000, John’s ideal replacement rate will be 50% while that of Mary will be 66%. The amount most people need after they retire to maintain their standard of living is usually significantly less than what they required while they were in employment. By the age of sixty-five (typical retirement age), most homeowners have paid off their mortgages, the majority of them do not still have dependent children, and they are no longer paying into a contributory pension scheme. In other words, their monthly overheads are considerably lower. This trend, however, has slightly changed since the financial crisis of 2007/8 and the Global Recession that followed it. The number of people aged thirty who still live with their parents today in the advanced economies is considerably higher than it was during their parents’ or grandparents’ generations. More elderly people than ever today are using their own savings, remortgaging their properties, or taking out personal loans to help their adult children get onto the property ladder. 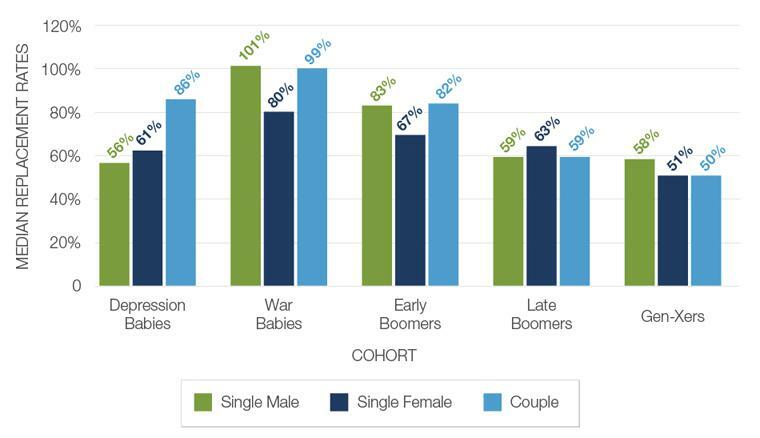 In this Pension Research Council Boettner Center video, Andrew Biggs, a resident scholar at the American Enterprise Institute, talks about the future of retirement replacement rates.